Japanese Prime Minister Shinzo Abe is on a two-day visit to Ahmedabad starting Wednesday. 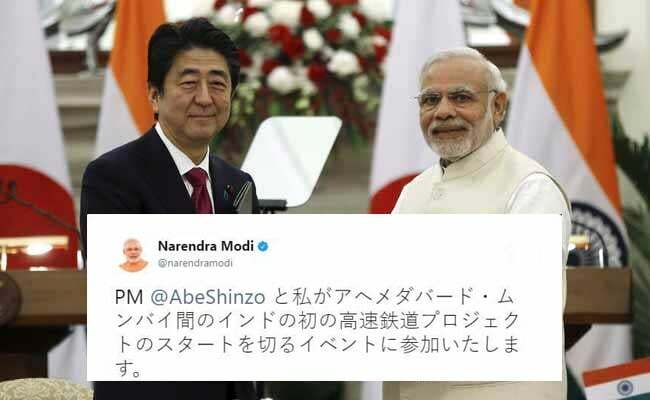 New Delhi: A day before Prime Minister Narendra Modi hosts Japanese Prime Minister Shinzo Abe in his home state Gujarat, he greeted his counterpart on Twitter - in Japanese. PM Modi, an active user of social media, used the microblogging site to welcome Mr Abe ahead of his two-day visit to Ahmedabad beginning Wednesday to inaugurate the much awaited Ahmedabad-Mumbai bullet train project. In four successive tweets, PM Modi announced their itinerary for the next two days, which includes a visit to Mahatma Gandhi's Sabarmati Ashram and the city's renowned Sidi Jaali mosque. On Thursday, the two leaders will lay the foundation stone for the 508-kilometre bullet train project between Ahmedabad and Mumbai. Later in the day, the leaders will discuss trade ties in defence and energy. The Japanese tweets were followed up with photos of a decked-up Ahmedabad for the high profile visit. PM Modi has tweeted in foreign language several times in the past. Earlier in July, PM Modi greeted Israel's Prime Minister Benjamin Netanyahu in Hebrew. Foreign leaders too have indulged in similar Twitter diplomacy in the past. Ahead of Prime Minister Modi's visit to The Netherlands in June, Dutch Prime Minister Mark Rutte welcomed him with a tweet in Hindi with words hilariously missing spacing in between.